Jeff has worked at Falvey since the beginning of his freshman year. 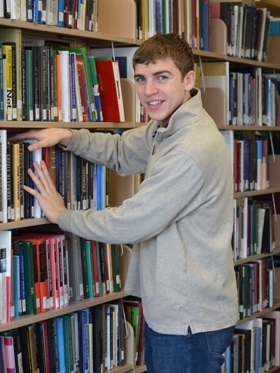 He says, “I have really enjoyed my time working at Falvey, especially working in the stacks. Not only do I have the instant gratification of finishing a bunch of small tasks, but also it is relaxing. I have taken a liking to listening to audio-books or catching up on news, via podcast, while shelving.” He has also been a Villanova resident assistant. Jeff is a member of the Villanova Singers and the Pastoral Musicians. He enjoys singing and golfing. He has a major in accounting and finance and a minor in real estate and will graduate in May 2015. After graduation he plans to work in the accounting department of a relatively large firm. “I could easily go the big four public accounting route, but from what I’ve heard about the lifestyle I’d much prefer sticking to the private sector. I’m a big proponent of having a strong work/life balance,” Jeff says. The University Staff Council (USC) of Falvey, led by Linda Hauck, business librarian, selects a student employee of the month based upon nominations from the department supervisors of student employees.